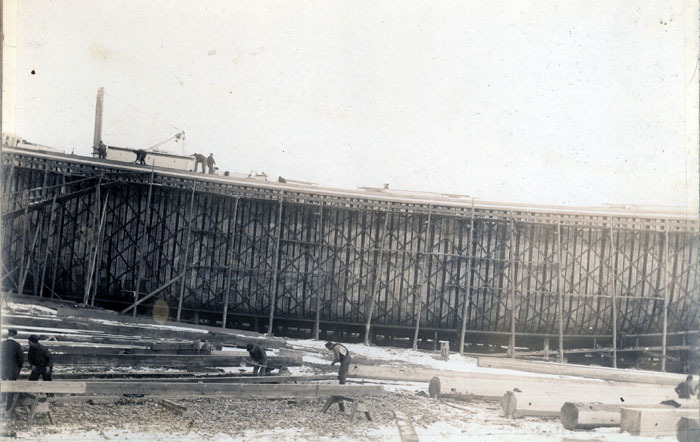 The five-masted schooner Harwood Palmer is under construction in this photograph. Here the frames are all up and planking is beginning. Note the iron straps that hold the frames together and strengthen the hull. In the foreground, on the right, there are five masts being shaped. The schooner was built in Waldoboro, Maine in 1904. Schooners like this primarily carried coal from from Virginia to northern cities.